Like 2013, I will continue living, training and racing with Eric Lagerstrom and Joe Maloy in 2014. I believe this is where I?? ?m supposed to tell about all the changes I have made over this off-season, and how that is going to translate into newfound success. While I have made a few changes in equipment (thanks to USA Triathlon and ENVE Composites??? more on that below), by and large, much is the same as last year. You may recall that last year I joined Paulo Sousa?? ?s The Triathlon Squad, began working with them in November of 2012 and then moved to Poway to train full-time in January. Similarly, this season?? ?s training began in November and I continue to live in Poway, training full-time with the same guys under the same coach. The reason for my success in 2014 won?? ?t be due to changes, but consistency. Winter training was good. We put in a lot of hard hours, enjoying most of them, surviving some, and staying engaged always. It?? ?s always great for a few months to pass and realize you haven?? ?t missed any training due to injury. Kudos to Paulo for training smart. 🙂 I?? ?m excited to translate this fitness into results. A few days after returning from Florida I will be heading off to Australia with training partner Joe Maloy. USAT will have a small camp where we will stay and train before racing the Mooloolaba ITU World Cup on March 15. There is a possibility for me to race in the New Plymouth ITU World Cup a week later, but as of now, I am not on the start list. There is a chance I will roll on to the start list, so I will be keeping an eye on that. This will my first time to Australia and I?? ?m obviously looking forward to it very much. Thanks to Litespeed?? ?s support of USAT, I will be racing on a new Litespeed L3 this year. I was on my previous bike, a Blue RC6, for nearly three years and it was time to upgrade. This was the first time I have had to opportunity to build a bike up from just the frame myself. With two mechanical engineering degrees (I finally finished my Master?? ?s of Engineering degree in December! ), I thought that if I can?? ?t figure this out, I might want to ask NAU for a refund! Thanks to a bit of help from training partner Eric Lagerstrom and Paulo, I finished the build in a couple of days. The bike rides and looks great, thanks in large part to ENVE. They sent me a fresh seat post, 40cm road bar and 100mm stem to go with the SES 3.4 Clinchers that I train on and SES 8.9 Tubulars that I race on. I have a? ?tentative race schedule posted. There are a lot of World Cups on there, and with Olympic points qualification beginning in May, these races will be more and more difficult to get into. It’s likely I won’t know whether I am racing until a couple of weeks before the event. The only way to really guarantee the races I’d like to do is to BE BETTER! 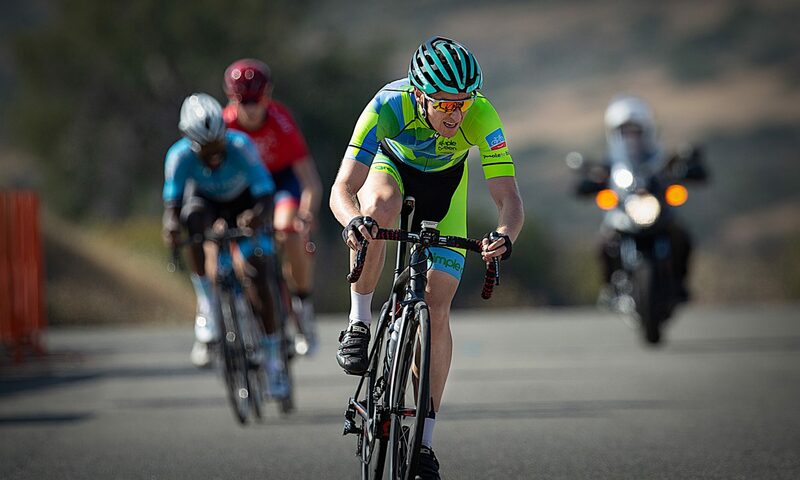 Third race up on the 4-week “PD World Tour” was a super sprint race down in San Diego. The format was swim-bike-run-swim-bike-run, with short legs of 300m for the swims, 4.5 miles for bike legs, and 1.5 miles for the run legs. Since this event isn’t part of a series or a championship and is not an ITU event, I planned to train through the event in prep for the following week’s World Cup in Cancun. The race was at noon on Saturday. It was a gorgeous day with temps in the low 80’s and sunny skies. I showed up a couple hours early and spent a good chunk of time checking out the course. First look at the bike course was shocking. The course was 10 laps of about 700m each. From transition it went down a parking lot, right turn into a tunnel about one car wide that went under a highway, right turn onto a bike path, right turn under another tunnel and a right turn back into the parking lot. My dad took a bunch of pictures, but unfortunately none of them really capture the unique bike course.? ?The run was basically a straight out and back course with 5 laps of about 500m each. This was the? ?inaugural edition of this race, and given its very unique setup, there were definitely some kinks to work out. There was a meeting with the small pro field of 20 guys about 20 minutes before the race where we went over everything. There was certainly some confusion and a little anxiety before the race, but I think everyone was excited to get out there and go FAST! I did a quick one-lap swim warm up. The water was real choppy and there was some surf that reached 3-4 feet. Because the course was so short, you basically made a turn around the first buoy just outside the surf and then came right back to the beach into the surf. I had a decent start and was one of the first to hit the water. I have done a lot of beach entries in practice this summer with Tower 26 and that experience paid off here. The water was pretty choppy which made it really hard to get an idea of where in the pack I was. I focused on a quick turnover and trying to catch a wave on the way back in. Coming out of the water I was in the thick of it, coming out just behind Olympian Manny Huerta and just ahead of Matt Reed. Out on the bike I was dangling at the back of the main pack. Coming out of each turn I got up out of the saddle to try to bridge up. At race-speed, the turns were quite sharp for me and I was uncomfortable heading into each one. Coming out of one of the tunnels on the fourth or fifth lap, I overshot the turn and went into some grass/sand. I was able to stay upright and get back on the pavement, but the damage was done mentally. Each turn made me more and more nervous. At this point I was no longer racing and kind of just getting through it. The pack got away and put a pretty large gap into me before heading into T2. The run course was set up so I could see how far ahead everyone was. One by one I picked off guys and worked my way back up into the mix. Knowing there was another swim coming up, I wanted to get up into a pack that I could hopefully draft off of. I did a pretty good job of that, catching Derek Oskutis and Tommy Zaferes just before transition, but the plan fell apart from there. Running through the sand and back into the water was incredibly difficult. I often have dreams? ?nightmares about running where I have no power and I feel like I’m in quick sand, which is basically what this felt like.? ?Great, I’m reliving a nightmare during a race.? ?I tried to comfort myself by telling myself everyone is feeling the same and that this was just a 300m swim. Coming back out of the water I only lost a couple of places, and was potentially back in the hunt. As I ran to my bike I remembered the dammed bike course I would be riding. Again, I had no confidence in my handling abilities and was nervous heading into most of the turns. After losing a bunch of places and time, I finally got to the second run. I hadn’t ridden all that hard, so I got off the bike and immediately started charging down the course. I soon caught the leader Greg Billington, who was a lap ahead of me at this point, and used him to??gauge? ?my pace off of. About halfway through I went by him to try to catch the next guys ahead, and he jumped on my shoulder. At this point I couldn’t help but think if I had ridden the bike more??aggressively? ?that I could be running with Greg one lap ahead, challenging him for the win. Another reminder that triathlon is SWIM-BIKE-RUN. After a little shuffling around of the results due to a couple guys not completing the whole course, I ended up 11th place. This race paid 10 deep, making 11th perhaps the least desirable position to finish. Knowing that I left so much time on the table during the bike, which is generally a strength for me, especially in draft-legal fields, made it more difficult. The takeaway from this event is pretty clear — learn to corner on the bike better. Once I get that down, I would love to return to one of these F1 events. They really are a lot of fun and seem like a great training tool to teach aggressive tactics and perfect transitions. With one more race on the schedule, I went out on a longer cool down with a few of the other younger American guys after the race. The next day I met up with Eric Lagerstrom to hook up with a local group ride. We ended up getting a little lost and riding way longer than we planned, which often make for the best and most memorable rides. Eric is competing at U23 World Championships in Auckland, New Zealand this weekend, so I wish him luck. After the ride with Eric on Sunday, I had brunch at a great restaurant on the ocean with some of my family for my mom’s birthday. It’s crazy to think how active she is at 55, completing yet another half marathon just yesterday in San Francisco! Her commitment to living a healthy, active lifestyle is a great example for me to follow. I can only hope I’m able to accomplish the same things when I’m her age.